When the children at the Covadonga Sugar Mill saw that great white beast, their mouths dropped open. The only thing that dragged them away from the cage was the certain punishment awaiting them at home if their escapade was to be found out. Driven by their curiosity, girls and boys had come to see the exotic animal on their recess break. The escape from the schoolyard was worth it. It isn’t every day that you can say: “They’ve brought a Polar bear!” People talked about how the circus performers had to throw buckets of ice water every so often to cool off the poor animal who only moved his head back and forth and huffed and puffed, half dead from the heat. The adventure that is the Cuban circus is surrealistic and amazing, involving more than 200 years of history. The first wandering artists were the ancestors of what became, with the passage of time, two branches of the theatrical arts, many times sharing a symbiotic relationship between them—the circus and the vernacular theatre. By around 1800, in what would become the Plaza de Marte, a canvas lean-to called Circo Ecuestre (equestrian circus) was erected; in time, this came to be called the Cuban Circus. The Circo Ecuestre was the oldest of its kind and became the artistic training ground of Francisco Covarrubias, considered to be the Father of Theater in Cuba. But it wasn’t until the first years of the 20th century that a veritable explosion of circuses occurred in Cuba. There were all types and sizes, from the two-bit tents with artists accompanied by their children to the great glamorous Cuban circus companies that toured the entire island. The circus was the last of the theatrical enterprises to be completely nationalized after 1959. 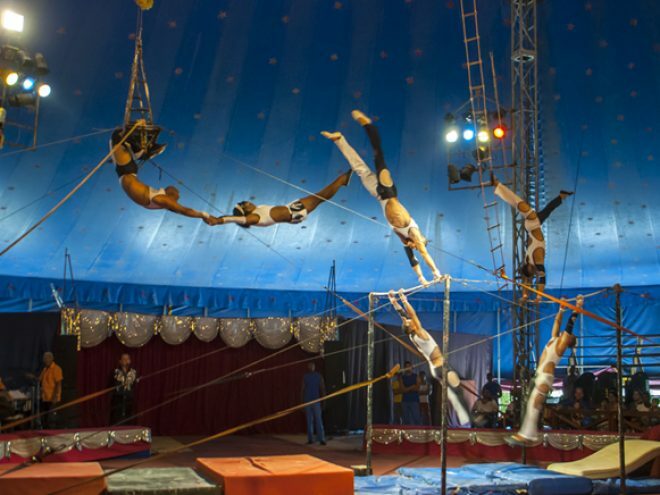 The National Circus of Cuba debuted at the well-known Parque del Curita in Centro Habana. In February of 1962, the young Revolutionary Government gave the Tourist Attractions and Centers Enterprise a four-masted blue tent, a 34-car train with kitchens, dormitories, offices, restaurants, electrical generator, drinking water tank, bathrooms and a daycare center for the artists’ children. The Blue Tent toured the entire country for ten straight months. Born in 1981, the Circuba Festival was forced to take a long hiatus in 1991 due to the profound crisis in the country. In 2008, it returned to the circus world of Cuba. Since then, it has become the largest circus festival on the American continent and one of the most important festivals in the world. Great State companies such as those from Russia, China and Vietnam attend the event as well as European, Latin American and North American artists. The Circuba Festival culminates with the national Circuba Tours Cuba event, which takes the best acts to other cities outside the capital throughout the island. In 2005, the Trompoloco Tent was inaugurated at its site on 5th Avenue and 112 in Playa, next to the former Coney Island—now Isla del Coco Amusement Park. The tent is headquarters for the National Circus and gives shows every Saturday and Sunday at 4 pm and 7 pm. Cuban circus artists can also be seen at the Mella Theater and in night clubs such as the Tropicana Cabaret and the Meliá Cohíba Hotel’s Habana Café.